Make your reservation on our webpage and get the lowest price guaranteed and enjoy offers and special promotions. Special offer with a 12% off for reservations of 3 or more nights. Available in all kind of rooms. Located at an exceptional situation, in the centre of Madrid, we offer salons for social events, businness meetings, restauration service, gym, sauna and our team personal attention. Live the unique experience of sleeping opposite the Palacio Real in Madrid. You deserve a stay at Hotel Ópera. Come to the gym and enjoy panoramic views of the rooftops of the Austrias´s Madrid . It´s appetizing, isn´t it? Café de la Ópera, Mediterranean meals at any time. We have different kind of rooms in our hotel, select the one that best adapts to your necessities and wake up in the Madrid of the 19th century, by the Teatro Real de la Ópera. For two people, with two single beds or a double bed. A space of comfort and tranquility in the centre of Madrid. Double rooms with a double bed or two single beds and an extra bed for a third person. Unique rooms with jacuzzi for being surprised and enjoying, with unique views of Teatro Real or Palacio Real. Ideal for couples with children who choose Hotel Ópera to enjoy several days in the Austrias´s Madrid. Individual rooms for people who travel alone. Personalized decoration which benefits relaxation. We offer you the services you will enjoy while staying at Hotel Ópera, in the centre of Madrid, opposite the Palacio Real and the Teatro de la Ópera. 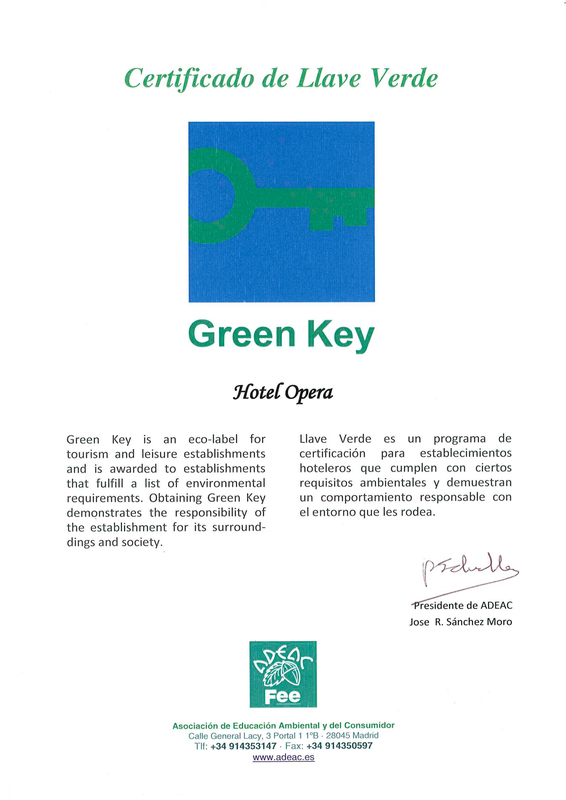 The hotel is located opposite the Teatro Real de La Ópera and not too far away from Plaza de Oriente, Palacio Real, Plaza Mayor in the Austrias´s Madrid. En mis 37 años aquí en el Opera, he visto la flor y nata de España y de todas las naciones del Planeta Tierra. One of my most loved hobbies is playing the guitar, and if I am asked to I also sing.